Spireites conceded yet another last gasp Proact goal to go down 2-1 to league leaders Burton Albion. With the blue-shirted players and their fans screaming for a penalty after Jay O’Shea was bundled over, the Brewers cleared their lines and sub Jerome Binnom-Williams burst from the halfway line leaving all-comers in his wake to slide the ball beyond Tommy Lee to break home hearts for the third game in a row. Sam Hird headed in his first goal of the season within two minutes, converting Dan Gardner’s corner that had been earned well by Gboly Ariyibi, who later hit the side netting after a superb Gardner run. Burton had two great first half chances, the busy Nasser El Khayati saw Ian Evatt block on the line whilst Lucas Akins wasted a one on one, the first of several fluffed lines but he did hit the bar after Stuart Beavon had stabbed home in the first minute of the second half after some poor defending by the home side. 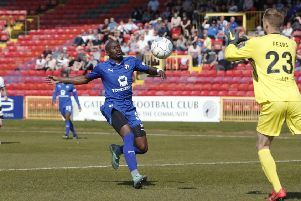 Chesterfield began to look more likely to score as the game ticked by. Hird, who made a number of last ditch blocks, headed an O’Shea free-kick downwards for Jon McLaughlin to make the save of the game and sub Armand Gnanduillet had a far post header blocked on the line from Dan Jones’ free-kick before the stoppage time hammer-blow by Binnom-Williams. Chesterfield: Lee, Talbot, Hird, Evatt, Jones, Morsy, O’Neil, Gardner (Simons 66), O’Shea, Ariyibi, Ebanks-Blake (Gnanduillet 71). Subs (not used): Cairns, Banks, Orrell, Raglan, Herd. Burton: McLaughlin, Edwards, Mousinho, O’Connor, McCrory, Akins Palmer 90), Weir, Butcher, El Khayati, Duffy (Binnom-Williams 84), Beavon. Subs (not used): Matthews, Joachim, Naylor, Thiele, Flanagan.